Machinists Inc. From single parts to complete manufacturing systems, MI is your global 24-hour-a-day problem solver. Machinists Inc. has been solving complex machining problems for more than 50 years. It is the largest precision machining shop in the Northwest specializing in single components to complete manufacturing systems 24/7. Recognized for technology problem solving, MI reacts quickly and reliably to deliver successful projects. World class welding experts, design and engineering professionals and large machine capacity provide MI the capability to be schedule driven at a competitive price. Turnkey projects, including integrated systems, and just in time delivery, accomplished from our 7 plants with over 250,000 sq. ft.
MI provides support for most major CAD and solid modeling programs, including CATIA, Unigraphics, PRO-E and Solid Works. MI routinely uses customer supplied data to program many types of CNC machining equipment: 5-axis mills, horizontal and vertical boring mills, lathes and others. MI builds, installs and tests complete systems, delivering turn-key projects. MI can develop a materials pedigree with a build and heat treat plan. MI has an in-place ISO 9001 system, meets ITAR requirements, and has a certified quality level system. MI has processing support with a seamless array of services for project completion and project management teams for large projects. Industries served include aerospace, energy, marine, research and transportation. End-to-end services are provided to international companies such as Boeing, GE Aviation, Genie/Terex, General Dynamics, Lawrence Livermore Labs, Lockheed Martin, Northrop Grumman, and Raytheon. From the simple component to the complex system, MI’s multi-disciplined staff and state-of the art equipment and production facilities can meet your needs. 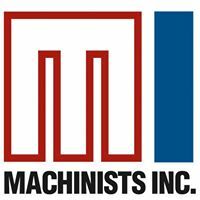 Machinists Inc. is committed to meeting our customers’ needs and expectations while providing World Class Quality and Service for the best possible value.